Home Health Information Sleep Problems and Menopause: What Can I Do? The years of the menopausal transition are often a time when there are other changes in a woman’s life. You may be caring for aging parents, supporting children as they move into adulthood, and reflecting on your own life journey. Add hot flashes on top of all this, and you may find yourself having trouble sleeping at night. Not getting enough sleep can affect all areas of life. Lack of sleep can make you feel irritable or depressed, might cause you to be more forgetful than normal, and could lead to more falls or accidents. Some women who have trouble sleeping may use over-the-counter sleep aids like melatonin. Others use prescription medicines to help them sleep, which may help when used for a short time. But, medicines are not a cure for insomnia. Developing healthy habits at bedtime can help you get a good night’s sleep. Follow a regular sleep schedule. Go to sleep and get up at the same time each day. Avoid napping in the late afternoon or evening if you can. It may keep you awake at night. Develop a bedtime routine. Some people read a book, listen to soothing music, or soak in a warm bath. Try not to watch television or use your computer or mobile device in the bedroom. The light from these devices may make it difficult for you to fall asleep. Exercise at regular times each day but not close to bedtime. Stay away from caffeine (found in some coffees, teas, or chocolate) late in the day. Remember, alcohol won’t help you sleep. Even small amounts make it harder to stay asleep. If these changes to your bedtime routine don’t help as much as you’d like, you may want to consider cognitive behavioral therapy. This problem-solving approach to therapy has recently been shown to help sleep disturbances in women with menopausal symptoms. Cognitive behavioral therapy can be found through a class or in one-on-one sessions. Be sure that your therapy is guided by a trained professional with experience working with women during their menopausal transition. Your doctor may be able to recommend a therapist in your area. 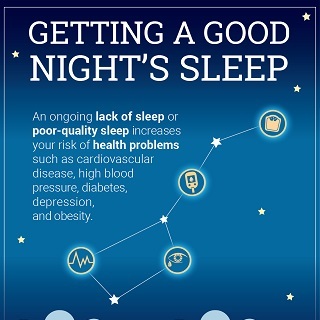 Learn more about getting a good night’s sleep as you age.